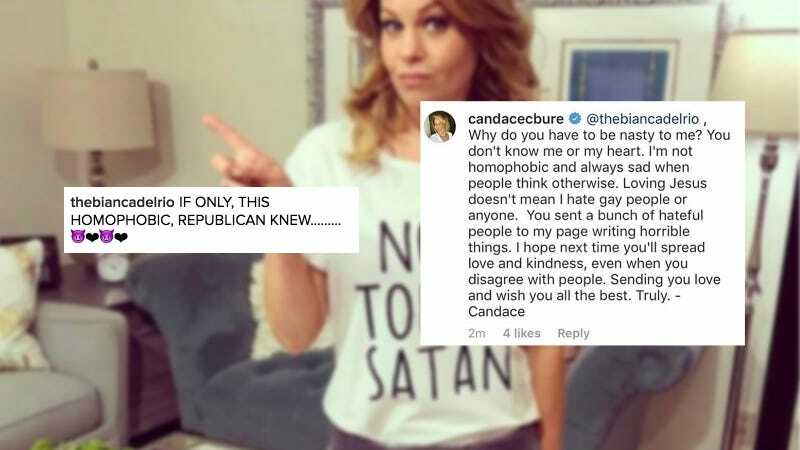 Candace Cameron Bure, star of Fuller House, sister of Kirk, and former token blonde conservative on The View, is currently embroiled in a bitter feud with RuPaul’s Drag Race champion Bianca Del Rio (aka Roy Haylock when out of drag). Like most wars in 2017, this one’s taking place on Instagram, and its fiercest battles are being fought in the comments section. So here’s what happened: Bure posted a photo of herself wearing a shirt that said NOT TODAY SATAN. Because Del Rio has more or less taken ownership of that catchphrase (despite the fact that it predates her usage on the show), she reposted Bure’s photo on Instagram along with the caption “IF ONLY THIS HOMOPHOBIC REPUBLICAN KNEW” (along with several heart and purple demon emojis). I’m really not on anyone’s team here, but would like to direct you all to this old story about Bure being cool with a business denying service to lesbians. Have you heard of a woman named Samantha Markle? No? Well, let me introduce you to her. Samantha Markle is the legendary and iconic half-sister of Prince Harry’s girlfriend Meghan Markle who is currently writing a memoir entitled The Diary of Princess Pushy’s Sister while simultaneously battling MS.
She may not be dating royalty, but this woman is definitely a queen.